HBX ConneXt closing session in Burden Hall. BOSTON—This past Saturday, nearly 500 students from more than 20 countries gathered on the Harvard Business School (HBS) campus to meet their classmates from HBX online programs and visit the Harvard Business School campus, most for the first time. The occasion was HBX ConneXt, a first-of-its-kind event hosted by HBX, Harvard Business School’s digital learning initiative, which created an opportunity for students from the HBX online programs to meet and build stronger relationships with each other and with HBS faculty members at Harvard Business School. HBX ConneXt offered a full day of academic exploration and community-building for HBX past and current participants. 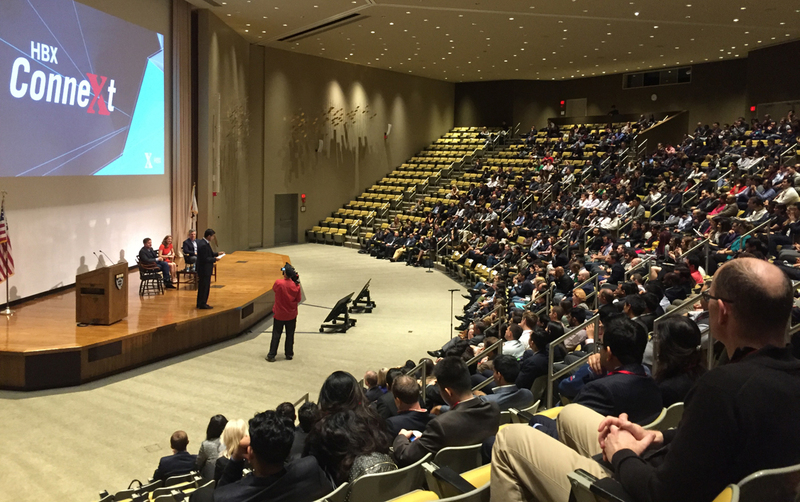 It was also an opportunity for the HBS faculty and administrators that developed the first HBX offerings to meet their students and welcome them to Harvard Business School. The HBS team included Prof. Bharat Anand, faculty chair of HBX and creator of the CORe Economics for Managers course; Prof. Jan Hammond, creator of the CORe Business Analytics course; Prof. V.G. Narayanan, creator of the CORe Financial Accounting course; Prof. Clayton Christensen, creator of the HBX Disruptive Strategy course; and Patrick Mullane, executive director of HBX. Anand described HBX’s origins from an idea about how to leverage technology to extend the School’s mission of educating leaders who make a difference in the world. He also explained how the design of HBX was rooted in the School’s famed case-method pedagogy. Some of these principles – active learning and peer interaction – sparked online and offline collaboration that eventually inspired HBXConnext. “Online going physical – it’s not something we ever imagined,” he noted. HBX ConneXt attendees had the opportunity to participate in faculty-led case study sessions in Harvard Business School classrooms. They also participated in breakout sessions in the Harvard University Innovation Lab that included hearing presentations on the MBA program, having their resumes reviewed and professional headshots taken, listening to new research from Professor Christensen’s Forum for Growth and Innovation, and participating in conversations in an “HBX Innovation Room” about new content offerings and formats. The closing session for HBX ConneXt included remarks from Professors Hammond and Narayanan, as well as a panel discussion about the future of online education led by Prof. Anand with Anne Dwane, partner and co-founder of GSV Acceleration; Chip Paucek, CEO and founder of 2U Inc.; and H. Lawrence “Larry” Culp, former president and chief executive officer of Danaher Corporation and currently a senior lecturer at Harvard Business School. In a closing session, Harvard Business School Dean Nitin Nohria took questions from ConneXt attendees, covering a wide range of topics, from the future offerings of HBX to ways in which the School can help facilitate the HBX community. HBX is currently accepting applications for summer cohorts of HBX CORe and Disruptive Strategy with Clayton Christensen. Founded in 2014, HBX — Harvard Business School’s digital learning initiative — is changing the way individuals learn about business. HBX was established to expand the reach of Harvard Business School and to further the School’s mission of educating leaders who make a difference in the world. While still in the early days of online learning on a global scale, HBX has a jump-start with more than 100 years of business education experience with Harvard Business School and a passionate faculty whose vision has been reimagined for the digital age. Find us online at hbx.hbs.edu. Since HBX began offering its unique online learning models (HBX CORe, HBX Courses and HBX Live) to students across the world almost two years ago, more than 7,000 have participated in CORe alone. HBX CORe is a three-course online business fundamentals program offered in varying durations (from as few as 8 to as many as 18 weeks). Unlike other online programs, the unique HBX learning model effectively marries Harvard Business School’s renowned case study method approach to teaching with an interactive, online, community-based curriculum in a way that provides an opportunity for individuals to learn business fundamentals by joining a supportive global network of HBX learners who are regularly called upon to engage within the course platform through online discussions, shared insights, peer feedback, and private Facebook groups. This combination of benefits enables students to learn from and network with a cohort of committed learners from around the globe in a truly unique way.